:Shy and unattractive as a child, Megan McClare has always been teased by her classmates. But when she returns home from her senior year in Paris, the wallflower has suddenly blossomed into a beauty. With ambitions to become a lawyer or doctor, Megan accepts an internship at the district attorney's office only to discover that she will be working with Devin Caldwell, a boy who mercilessly mocked her at school--and with whom she was hopelessly enamored. She turns to her dear friend Bram Hughes for support and advice. But Bram's vision is clouded by his sudden unwelcome attraction to a girl he had always thought of as a kid sister. He advises forgiveness, but can he forgive himself for pushing the woman he loves into the arms of another man? 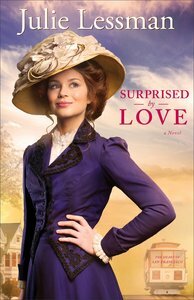 About "Surprised By Love (#03 in The Heart Of San Francisco Series)"
Customer Reviews For "Surprised By Love (#03 in The Heart Of San Francisco Series)"
Once again Julie Lessman has captured my heart with the last book in her trilogy:'Surprised by Love'. It is the story of Megan McClare. Growing up Megan was always the shy wallflower who just didn't fit in. At school she was teased relentlessly by Devin Caldwell the boy who made her heart race and left her in tears and red faced. Bram Hughes, a godly friend of the McClare family has always been there to pick up the pieces to Meg's heart and mentor her through her worries, tears and heart-break. After a year abroad in Paris and Meg returning looking like a stunning woman who Bram doesn't even recognise will he still be there for Meg as a mentor and a friend even when he starts to develop feelings for her that he doesn't believe he should have? What will happen when Devin begs Meg for forgiveness and reconciliation?